Revenues increased $4.9 million, or 5.5% on a comparative quarter basis, and $12.8 million, or 4.7% for the nine month period. Gross profit margin increased from 28.5% to 31.9% on a comparative quarter basis, and increased from 29.2% to 32.0% for the nine month period. Diluted earnings per share from continuing operations increased from $0.22 to $0.33 on a comparative quarter basis, and from $0.74 to $0.97 for the nine month period, an increase of 50.0% and 31.1%, respectively. The financial overview for the three and nine month periods include only the Company’s continuing print operations. The Company sold Alstyle Apparel, on May 25, 2016, resulting in the apparel division being classified as discontinued operations and the print division remaining as the continuing operations of the Company. The Company’s revenues for the third quarter ended November 30, 2017 were $93.6 million compared to $88.7 million for the same quarter last year, an increase of 5.6%. Gross profit margin (“margin”) was $29.9 million for the quarter, or 31.9%, as compared to $25.3 million, or 28.5% for the third quarter last year. Net earnings for the quarter were $8.3 million, or $0.33 per diluted share compared to $5.7 million, or $0.22 per diluted share for the third quarter last year. The 2016 third quarter operational results included medical expenses in excess of historical levels, which negatively impacted the prior year’s quarterly net earnings by approximately $1.3 million, or $0.05 per diluted share. The Company’s revenues for the nine month period ended November 30, 2017 were $283.1 million compared to $270.3 million for the same period last year, an increase of 4.7%. Margin was $90.6 million, or 32.0%, as compared to $79.0 million, or 29.2% for the nine month period ended November 30, 2017 and November 30, 2016, respectively. Earnings from continuing operations for the nine month period ended November 30, 2017 were $24.6 million, or $0.97 per diluted share compared to $19.2 million, or $0.74 per diluted share for the nine month period last year. The negative impact of the relocation and start-up of a folder operating company and higher than historical medical expenses negatively impacted the Company’s net earnings for the nine months ended November 30, 2016 by approximately $4.4 million, or $0.17 per diluted share. To provide important supplemental information to both management and investors regarding financial and business trends used in assessing its results of operations, from time to time the Company reports adjusted gross profit margin, adjusted earnings and adjusted diluted earnings per share, each of which is a non-GAAP financial measure. To provide additional information, the Company also reports the non-GAAP financial measure of EBITDA (EBITDA is calculated as earnings from operations before interest, taxes, depreciation, and amortization). Management believes that these non-GAAP financial measures provide useful information to investors as a supplement to reported GAAP financial information. Management reviews these non-GAAP financial measures on a regular basis and uses them to evaluate and manage the performance of the Company’s operations. In addition, EBITDA is a component of the financial covenants and an interest rate metric in the Company’s credit agreement. Reconciliations of non-GAAP financial measures included herein to the most directly comparable measures calculated and presented in accordance with GAAP are set forth in the following table. Other companies may calculate non-GAAP adjusted financial measures differently than Ennis, which limits the usefulness of the non-GAAP measures for comparison with these other companies. While management believes the Company’s non-GAAP financial measures are useful in evaluating Ennis, this information should be considered as supplemental in nature and not as a substitute or an alternative for, or superior to, the related financial information prepared in accordance with GAAP. These measures should be evaluated only in conjunction with the Company’s comparable GAAP financial measures. 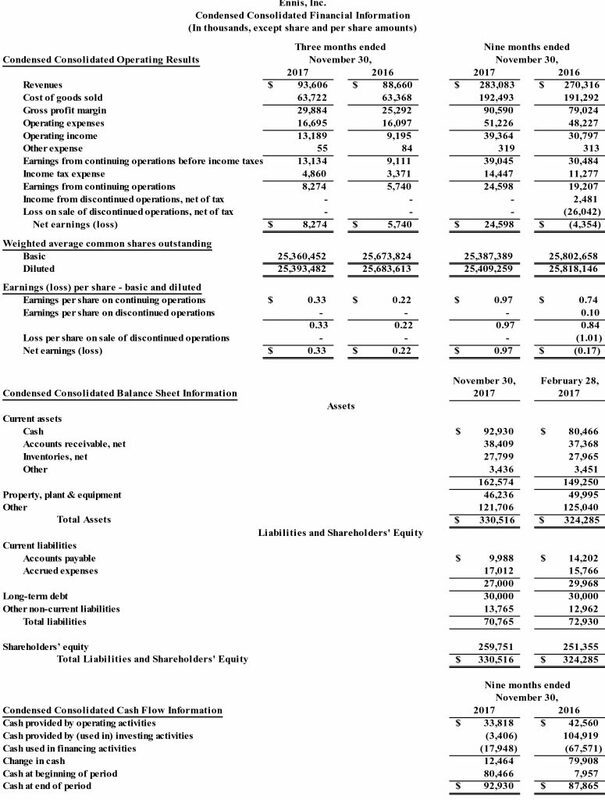 The following table reconciles EBITDA from continuing operations, a non-GAAP financial measure, to the most comparable GAAP measure, net earnings from continuing operations (dollars in thousands). Ennis announces that on December 21, 2017 the Board of Directors declared a quarterly cash dividend of 20 cents a share on its common stock. The dividend is payable February 9, 2018 to shareholders of record on January 12, 2018.